One look at the Chair and you'll be impressed with the design, features and its sporty two-tone hues. 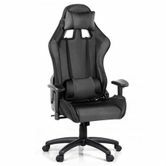 Upholstered in premium faux leather, the Chair seat is richly padded and comfortable thanks to its high density injection-moulded foam, and yet firm in the right places for adequate support. The PU leather seat is combined with breathable mesh material to keep the occupant well ventilated. And taking its design cues from a racing car seat, the high back body wrap Chair also features two holes near the headrest for use as built-in holders for scarfs and ties. Up, down and all around, the Ultimate Gaming Chair can be adjusted for height with its SGS-certified gas lift, and swivels 360 degrees to face any direction. Better still, the Chair can be reclined up to 135 degrees with a simple pull of a lever and locked in position. Together with the fully rotatable and height adjustable armrests, the Chair is simply a good seat to keep your feet up for a well-deserved break. Not least, the Chair comes with detachable head and back cushions for extra support when you need it. The back cushions can actually be adjusted to suit the right spot where you need support most. Plus, five dual-wheel castors enable the Chair to be moved quickly and effortlessly to where the action is.